Cowboy boots tend to spark and fizzle in popularity as fashion trends cycle. They had a moment in the ’80s, and we also vaguely remember owning a Charlotte Russe pair in the early aughts. If Selena Gomez’s latest look is any indication, cowboy boots are firmly back in the fashion lexicon. Gomez attended the Coach Fall 2018 Runway Show during New York Fashion Week on February 13th, 2018 in a long floral dress, lace-up western-inspired cowboy booties, and a moto jacket. Naturally, Gomez sat front row at the Coach show because she’s the face of the brand’s handbag line. We should also point out that Gomez is embracing a new look overall and ditched her short blonde lob for long brown hair (extensions?) with side-swept bangs. The actress/singer/executive producer looked amazing, but we keep coming back to THOSE BOOTS. They aren’t straightforward cowboy boots, but instead feel cowboy-inspired with a lace-up aesthetic we don’t usually associate with this style. We’re assuming the shoes are from the upcoming Coach collection, seeing as the brand has been doing a western bootie for a while now. Gomez also wore the brand’s hot pink “Western Buckle Bootie” in the pages of Harper’s Bazaar earlier this month. 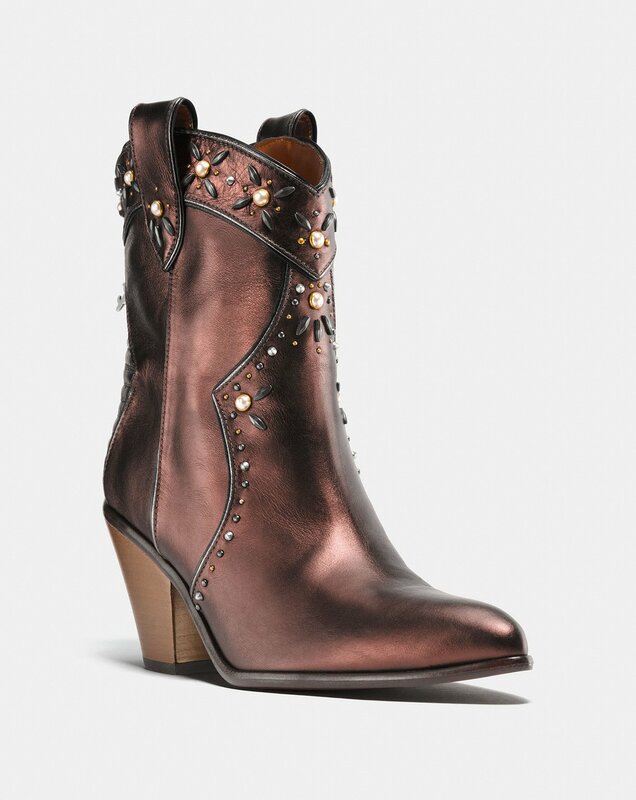 If Gomez’s booties inspire, Coach also has this millennial pink cowboy boot that will set you back a cool $525. "Know that a lack of action on social media is not a lack of my love," Gomez revealed on her Instagram Story today. "I’m working on a lot of stuff and I will love on you guys so soon, I promise. Also, last thing, I might get in trouble for saying this but I’m doing some really, really cool stuff with Coach. It’s coming. See, this is why I can’t be on social media. I just say everything!" Welcome back, Gomez, and welcome back, cowboy boots.